The 2018 Elantra lineup has a few stellar new updates this year that make it an A-list pick whether you're interested in a sedan or hatchback. 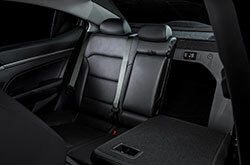 The standard Elantra receives a new SEL trim which replaces the former SE with Popular Equipment Package, and more features are standard on the Limited trim, such as an auto-dimming rearview mirror and attractive gloss black accents. Elantra Sport trims also get new standard features, including a power sunroof, lane change assist and blind spot monitoring with rear cross-traffic alert. Finally, all Blue Link services are now standard for three years! 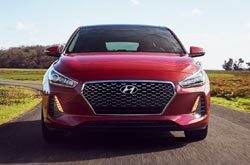 When it comes to the GT, the hatchback has a new design that 2018 Hyundai Elantra reviews call more attractive than ever. It's lower, wider and 22 percent firmer, plus it's down 61 pounds from before, all of which contribute to enhanced performance. If you plan to buy or lease a new 2018 Hyundai Elantra in Phoenix, you can choose from a multitude of trim grades. The Elantra sedan is offered in six trims, including SE, SEL, Value, Eco, Limited and Sport, while the GT hatchback can be had in base GT and GT Sport models. Depending on the selected trim, features range from Bluetooth and SiriusXM Satellite Radio to dual automatic climate control and heated seats. The Elantra also offers in-demand features like Apple CarPlay and Android Auto, an auto-dimming rearview mirror with HomeLink, and SiriusXM data services like NavTraffic, NavWeather, sports and stocks. Test drive a 2018 Hyundai Elantra at our car dealership near Arcadia and try out all available engines! 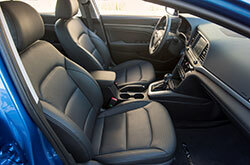 Sedans come standard with a 2.0L Atkinson cycle four-cylinder with 147 horsepower and 132 pound-feet of torque. 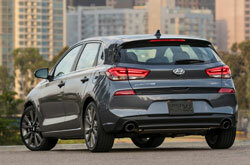 Eco and Sport models get separate engines: a 1.4L turbo GDI four-cylinder that achieves an EPA-estimated 35 mpg combined, and a 1.6-liter turbocharged four-cylinder with 201 hp and 195 torque, respectively. 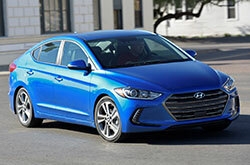 Phoenix Hyundai Elantra shoppers who choose the GT will have a choice between the base 2.0-liter four-cylinder with 162 hp and 150 torque, or the GT Sport's 1.6-liter turbo four-cylinder which produces 201 hp and 195 torque. Several safety technologies are available to help keep you extra protected. From lane keep assist and smart cruise control to automatic emergency braking with pedestrian detection and blind-spot detection with rear cross-traffic alert, there are numerous options that will enhance your confidence on daily drives. In addition, the 2017 Elantra was named a Top Safety Pick+ by the IIHS and the 2018 model is projected to receive the same honor. Continue our 2018 Hyundai Elantra review below to see video and use our third-party car comparison tool. If you're in the market for new car models in the Phoenix metro area, you may have seen the 2018 Nissan Sentra, Toyota Corolla, Honda Civic, Chevrolet Cruze and the Ford Focus, but the 2018 Hyundai Elantra is also a reputable option. Offering an up-for-anything personality and plenty of on-board technologies, it could be just what you want from a vehicle. 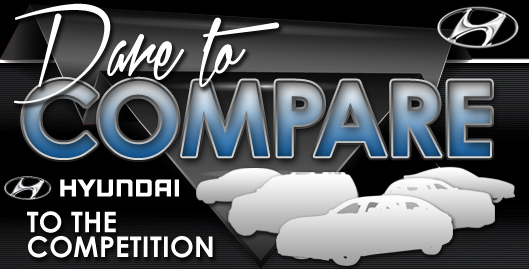 Take advantage of our evaluation and try out the compare tool to see if the 2018 Hyundai Elantra works for your day-to-day needs. When you've made your choice, check out the financial incentives available here at Camelback Hyundai. As your hometown Hyundai franchise, we're the spot to find factory offers on the Hyundai Elantra, as well as other new and well-maintained used vehicles. Note the details and specs that you found pertinent after viewing our 2018 Hyundai Elantra review; those are the specifics that will safeguard you from making a purchase you feel uncertain about. We have a large selection of Hyundai Elantra models for sale in Phoenix, AZ; stop by for a test drive - requesting an appointment on our website is easy. Also, before your visit, you can see its stylish cabin from all ends by viewing our video walk-around above.